Most of us will agree that the psychological and physiological benefits of bathing are enormous yet the majority of us with the capacity to bath independently take this for granted. Imagine being bedbound and never experiencing the relaxation and rejuvenation of tip to toe cleanliness, being immersed in a warm bath, or just standing in the shower aware of every comforting drop touching your body. For many receiving care in an acute or community setting just imagining that experience is all they can hope. Bathing for them is Assisted Bathing, which means carer intervention is required to perform the basics of a personal hygiene routine rather than that of a much more personal experience. But thanks to the expert team of assisted showering designers and manufacturers at Reval, personal hygiene wellbeing has become a reality for the customers of Bury based adult social care provider Persona Care & Support. We interviewed Eddie Cheung – Head of Operations (Short Stay) at Persona Care & Support, about the transformative effects Reval’s mobile shower unit, the Ruby, has had for customers and staff. How does offering assisted showering facilities benefit your customers? We had a lady who hadn’t had a full body wash for ages; she was bedbound and couldn’t access the bathroom easily. This lady said it was like a spa experience ‘all I’m missing now is the candles and music.’ So for her next bath, staff did just that, they put music in her room! Another lady in the later stages of dementia wouldn’t let anyone do any personal care for her, not even her own daughter. She hadn’t had a shower in ages. When they managed to convince her to try Ruby. She was so content and relaxed with Ruby that her daughter commented she had never seen her so happy having a shower. Things like that clearly show that these innovations really work. How have Reval products had a positive impact of staff? Feedback from staff was that although it can be a little more time consuming, it’s worth it to offer such a positive experience to the customers, and that they weren’t making people unnecessarily uncomfortable moving and handling them when they could literally convert the customer’s bed into a bath with a special sheet. Once that’s in place, you’ve just got one hose with warm water going in and one with suction removing the water, so it’s very easy to use. it’s easy to use, it’s user friendly, It’s been positively received, which doesn’t go for all changes, but when Ruby came along, pretty soon it was ‘it’s brilliant, it’s amazing, let’s use it’ to the point where a member of staff would volunteer to do the baths just because she wanted to use it. It got the staff talking, as it was something they hadn’t seen before, and for them to see that they had had this investment made in them was a really positive thing. You are committed to helping your customers maintain their independence. How does using the Ruby help with this? It maintains their dignity and respect, to be able to have a wash in their rooms, but more importantly, for people who haven’t had what we would consider a proper wash for such a long time, it’s about that customer experience. Ruby makes it possible for people who are bedbound to participate, by rubbing soap on them by themselves, even just a little bit, which they don’t normally get the chance to do. There have been occasions where people have been reluctant to have a bath, so we’ve suggested Ruby and they’ve loved it. The bonus is that you have a content staff team who are happy to take up the challenge of encouraging reluctant customers to have a bath. There was one gentleman who told us that he ‘didn’t fancy that at all’ but afterwards said ‘thank you, I feel so much better for that’. How important is it to be able to offer exceptional facilities to your customers? With bathing facilities, some people won’t have one because they are hesitant, or their physical condition may make it awkward or uncomfortable, Ruby helps with that, enabling customers to have their first full body wash in ages – we receive fantastic feedback from customers and relatives. Maintaining personal hygiene is particularly important for people who are prone to infections, and when people can’t have a ‘proper’ wash easily, it can affect their self-esteem; they don’t want to walk around like that, so we can fix that in a different way with Ruby. How does offering assisted showering facilities benefit your service? It means we can take in a broader range of customers and provide a better experience for them. Some peoples’ families want them to have a shower every day, but sometimes moving and handling requirements don’t allow us to do that the traditional way. The Ruby gives us another option and the ability to offer something different to make it possible. Assisted showering doesn’t have to be a procedure, and as Reval have proved, it can be the most uplifting and rewarding experience if the right equipment is used with the will to improve customer wellbeing – ignore the benefits of bathing at your peril if you are looking for a more inclusive service. 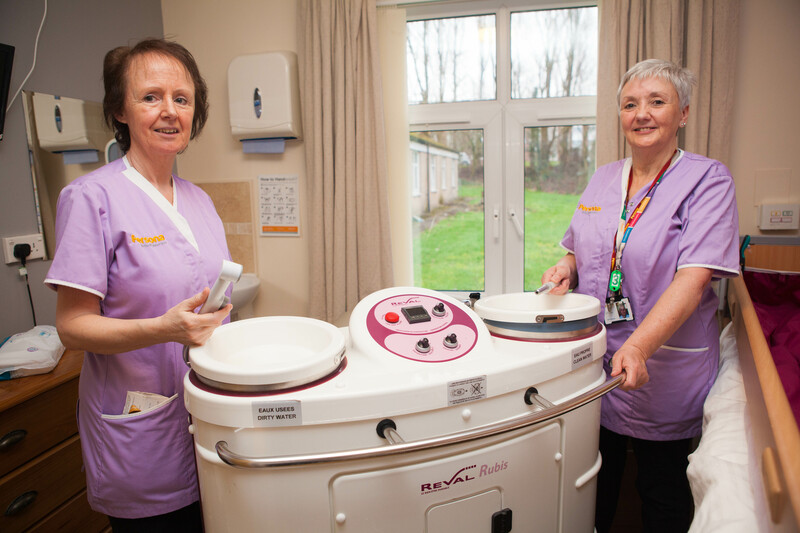 Reval Continuing Care innovate and manufacture assisted bathing and showering products that transform personal hygiene routines in care settings. Designed with wellbeing in mind the highest of quality materials are used for durability and improved users experience. Designed for industrial use, such as in hospitals and nursing homes, Reval products provide long-term reliability and meet stringent quality standards and legal requirements such as CE certification, WRAS Category 5 compliance and TMV3 (D08) certification, and are also ISO9001/8 quality certified.